Sole: If you every tried or ran in the original Adidas Adios 1 (unboosted), the sole will be very familiar to with. Why? Because to me it looks to be almost exactly the same minus the posting in the midfoot. This to me is awesome. The Adios 1 and 2 were both fantastic shoes that can be called the fastest marathon shoes of all time... because multiple world records have been set in them. The ride is firm with an incredibly durable outsole with the usual continental rubber. The extended torsion system into the forefoot is present and gives some amazing pop (wish the Takumi series still had that...). What I find interesting in this shoe is that the quickstrike nubs are only present in the forefoot and medial forefoot. The lateral forefoot and the rest of the shoe do not have them, but that may be for the best. The continental rubber gives plenty of traction and is put in places that most people will land (ie the lateral forefoot or heel). Putting these in that section of the forefoot does not feel strange to me and gives great traction during toe-off (or terminal stance/pre-swing for the physical therapists and biomechanistics). And the posting in the midfoot? It is very mild. I'm only aware of it when I get really tired, but for the most part I do not notice it. That is just the way I would posting in a long distance racer to be. Only helping out when you get tired. For those of you who pronate less or more (for whatever reason be it increased midfoot flexibility, decreased peroneus longus eccentric control, weak lateral rotators in the hip, etc), you may feel the posting to be more prominent but I doubt it will bother anyone given how smoothly it is integrated with the rest of the midsole. Upper/Fit: The upper fit is that of a classic racing shoe/marathon racer. It is snug but not tight. My toes have decent room in the toebox and seem to be held down well in the midfoot and heel. There is a firm heel counter in the rearfoot but it is not as aggressive as some shoes. For those of you with wide feet I would take a look at Raktuen as wide versions are available (as they are for many other Adidas shoes.... I have a review that addresses that coming out soon). I would not wear this shoe barefoot as being a bit old school (ie being almost the same as the Adios 1) there are some seems throughout but they have never bothered me. That being said the mesh does seem to breath well so if you have tough feet... go for it I guess? Responsiveness: These shoes have some great responsiveness!! Thanks to the extended torsion system that goes all the way into the forefoot, the firm sole from the continental rubber and adiprene in both the lateral heel crash pad and the forefoot as well as the quickstrike nubs all contribute to making this a fast shoe. It's not necessarily the shoe I would use for 5k-10k but definitely a shoe I would use for the half marathon, marathon and even ultra marathons given the ride and legacy from the Adios 1. If you like firmer shoes, you could even use this as a daily trainer, which I have done. There is plenty of shoe there for that and I especially enjoyed using these on the horse trails in Norco, CA as they were light, durable and the quickstrike numbs had excellent traction in the dirt. Heel-Toe Drop/Ramp: The Mana 7 has a 9-10mm drop and that is what it feels like. The drop feels almost exactly the same as when I tried on the original adios 1. Durability: The durability on this shoe has been fantastic. I have 135 miles on my current pair (another is on the way) and only see very minor wear in the lateral heel and middle forefoot. The ride has also retained a similar feel and continues to take me through longer workouts. I have not seen any loose seems in the upper and overall that area is also holding up well. Weight: I weighed this shoe in at ~8 ounces (just like the adios 1) and it actually feels a hair lighter. I assume the additional lightness comes from how responsive this shoe can be. 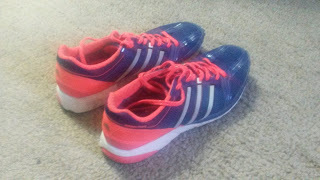 Thoughts as a DPT (Student): I appreciate a great deal of things about this shoe as both a runner and DPT student. The mild amount of posting integrated into the sole will do well for many people in longer races and workouts. I doubt it will affect the <5% of the population who actually supinate since I do not find the arch to be particularly intrusive. The heel has a decent bevel to it and the toe spring is not excessive. The firmer midsole increases the stability of the shoe by providing a more stable plateform (soft shoes are inherently more unstable). The firm heel counter will hold the calcaneus well and serves as an additional point of stability. For those with sensitive achilles insertions or hagland deformities I would be wary of this shoe but I have not had any problems. 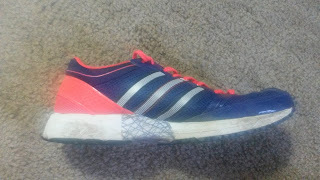 I do wish the sole was full contact as that is more natural and increases the stability of the shoe, However, unlike some Asics shoes I have never felt the separation in the outsole due to how mild it is in most Adidas shoes. I also can't complain to much about a shoe based on the last of a shoe that has set marathon world records. 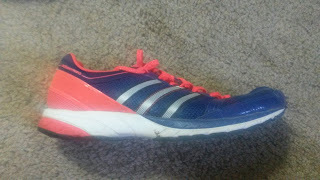 Final Thoughts: I have really enjoyed using this shoe both as a trainer and as a longer distance workout shoe. 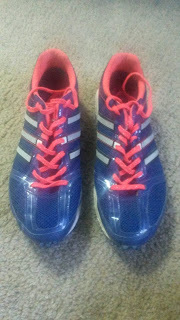 When I do run another half marathon, this will be the shoe on my feet. The very mild stability is awesome when you get tired on long runs or workouts and the shoe has the responsiveness to take you through races. If you really liked the original Adidas Adios 1 and need some mild support, give this shoe a look. 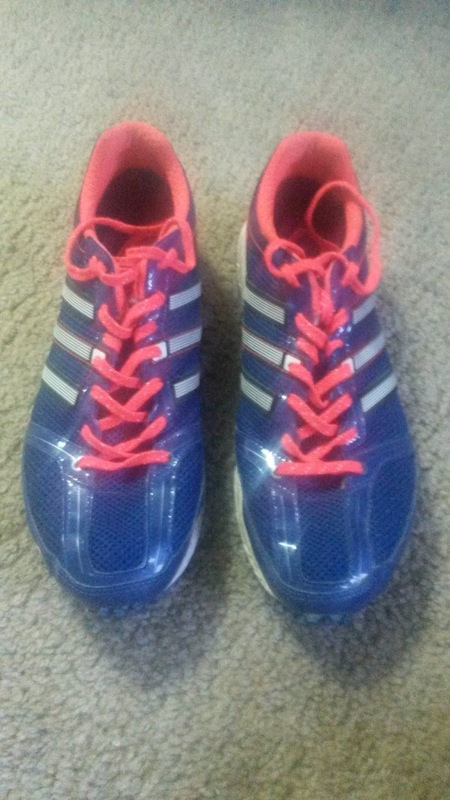 Or if you are looking for an awesome marathon racer with mild stability. I very much hope that an Adidas Mana 8 is made based on the Adidas Adios 2 (unboosted) with mild posting. That would be my perfect half/full marathon racer as I will always have a special place in my heart for the Adidas Adios 2 (such an awesome shoe...). Spoiler Alert! Adidas will be re-releasing the original Adidas Adios 1 in the bright yellow colorway in December of this year. 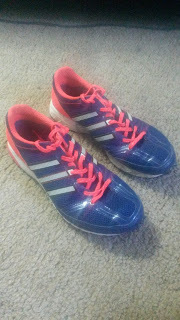 The full title is the Adidas Adios 1 Haile, after Haile Gebrselassie. If you can be patient, wait. If not grab a pair of Mana 7s! These shoes were a personal purchase and are not readily available in the United States. 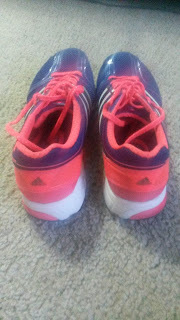 I purchased my pair on Rakuten through Step-Sports. I put at least 100 miles on every pair of shoes before I review them (except racing flats which I put on at least 50 miles). Currently I have 135 miles on my pair.